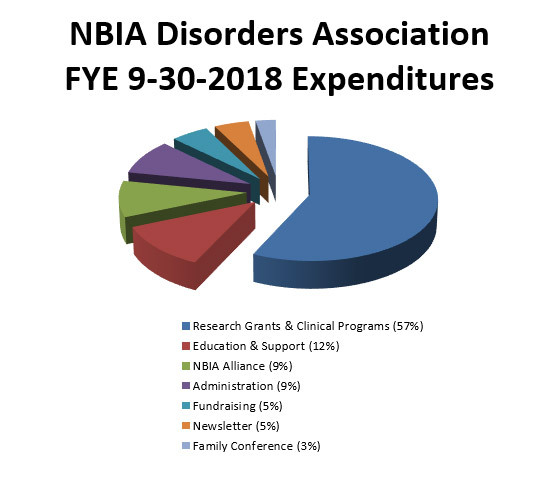 We rely on donations to meet our goals of providing support to NBIA families, educating the public about these rare disorders and supporting research with collaborators from around the world. We are dedicated to helping NBIA families. Some of the ways we do this are through our group forum, which provides immediate support and feedback; our website that has the latest news and information about NBIA; social media; a newsletter that we publish three times a year; and a Networking Program for NBIA families. We also hold clinics every two years to give NBIA families the opportunity to meet privately with doctors familiar with NBIA, in conjunction with our family conferences where families come together to socialize , provide emotional support and information to each other and hear from researchers and other experts. We have organized two scientific workshops and have participated in research symposiums for NBIA. Since 2002, we have funded 28 research grants valued at $30,000 to $150,000 each, totaling $1,098,205. We have also funded other NBIA research projects for a total of $1.5 million dedicated to NBIA research to date. Where do the donations go? We are proud that our administrative and fundraising costs are very low compared with those of many charities. To learn more about the work we do, our financial history and spending, we invite you to review the IRS Form 990’s that are available here. Copyright 2013-present, NBIA Disorders Association. All rights reserved. This site may not be copied or duplicated in any fashion without the Association’s consent.